3-D Monster: Batman vs Superman Has an Official Title and Logo! 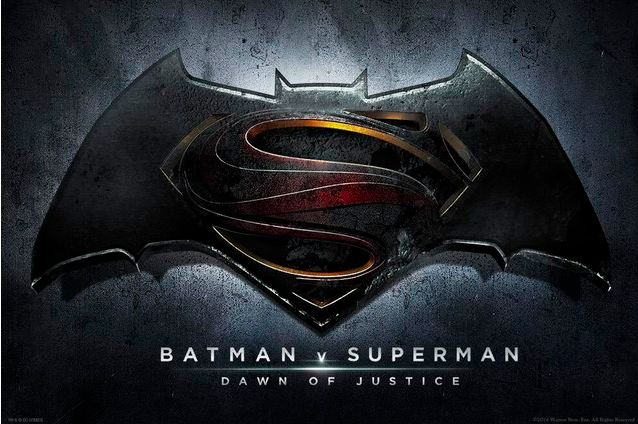 Batman vs Superman Has an Official Title and Logo! Zack Snyder's upcoming ensemble superhero film finally has a title: Batman v. Superman: Dawn of Justice. The film will see Henry Cavill reprise his role as Superman from Snyder's 2013 Man of Steel and Ben Affleck filling the role of Batman — who we got a first look at in costume just the other week. A number of other heroes and villains are set to turn up in the film, including Wonder Woman (Gal Gadot), Lex Luthor (Jesse Eisenberg), and Cyborg (Ray Fisher). Filming has already started for the movie, but it'll be a long time yet before you can watch it: it's set to open on May 6th of 2016.
but why... oh why are they versus? treading thin waters of many mistakes... i don't care for eisenberg and that is my first problem. I guess they're gonna have a Dark Knight Returns-style smackdown? I'm not a big Eisenberg fan either; Kevin Spacey should return and simply play it as Frank Underwood sans hair and southern accent.